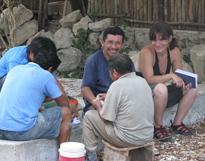 OSEA Intensive Maya Language Learning Program is based on LANGUAGE IMMERSION in Maya speaking communities & families. Comment on the Correct Name of the Maya: Maya, Mayan, Yucatec Maya, Yukatek Mayan? The course is based on the Spoken Yucatec Maya Lessons by Blair and Vermont Salas textbook and audio component (lessons 1-6 for Beginning; lessons 7-12 for Intermediate; lessons 13-18 for Advanced). These lesson books are available at other university language programs for $70-80 US dollars, but are included within the tuition cost of the OSEA Maya Program. 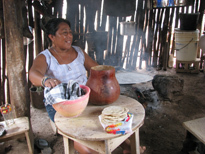 OSEA also provides participants, Ko'ox Tsiikbal Maya T'aan by Quetzil Castañeda which is a Maya lesson book for English speakers that has been developed over the course of seven years of teaching Maya at Indiana University. There are Beginning, Intermediate and Advanced levels and each book includes eash to grasp explanations of grammar, vocabulary and grammar flashcards, practice conversation exercises, quick grammar charts, language practice conjugation drills, and translation units in both written and audio format. In addition, OSEA provides a limited number of additional texts such as short stories, songs, lyrics, dictionaries, glossaries and related materials in pdf format that we encourage you to print, bind and bring with you. Maya students are required to purchase Maya dictionaries out of pocket. There are two Maya-English dictionaries are recommended above all others: Victoria Bricker and Po'ot Yah, Dictionary of Maya as Spoken in Hocaba, and the John Montgomery, Maya Dictionary and Phrasebook. There are other dictionaries and traveler phrasebooks in English available on Amazon. We do not recommend the purchase of these. The Bricker Hocaba Dictionary is a bit expensive at $60 but with luck you can find a used copy for as low as $30. This is a crucial resource to learn Maya but it is not very portable. The Montgomery Dictionary is $12 new and can be found at times at half that price. This is a highly portable pocket book dictionary that can go everywhere. In addition, once in Yucatan you are encouraged to purchase one or more of the available Spanish-Maya dictionaries. The best dictionary to date is the Patricia Huchim edited dictionary published by Dante Books. This very inexpensive $10-$12 book is highly portable and ESSENTIAL to purchase. Prof. Miguel Guemez published a new Maya-Spanish dictionary in March 2012 and we look forward to using this book as well. It is recommended that Maya students who are interested in purchasing these dictionaries travel to Merida where these materials are sold. There are several bookstores in downtown Merida, on Calle 59 betw. Calles 60 and 62, for example. As well there is the Universidad Autonoma de Yucatan bookstore on 57 betw. Calles 60 and 62. The main Dante Bookstore is located on Prolongacion. In downtown Cancun, on Avenidad Tulum, the Fama Bookstore, once upon a time was an interesting bookstore that did simply cater to foreign tourists. Check there. Playa del Carmen does not have decent bookstore. European expats in Tulum are likely to have one or more metaphysical bookstores but not likely to carry these Maya language books. In those cases where students are unable to make such a trip, OSEA can arrange for specific dictionaries to purchased for the student so that they may have these on arrival.